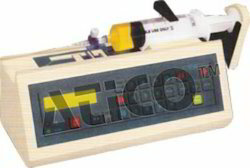 Manufacturer of a wide range of products which include syringe infusion pump. The control panel is self-explanatory with abbreviated operating instructions on LCD, Easy-to-rcad liquid-crystal displays all essential data in large size numbers, reducing the chance of erroneous readings, LCD provided with backlight for viewing in dark environments. As versatile as they are reliable, these syringe pumps provide selectable, pressure level settings to match virtually any requirement Low, Mid high-occlusion setting. "Keep-Vien-Open" function. When the preset volume is reached, the pump automatically engages the 'Keep Vein Open' automatically (KVO) function, Infusion rate in KVO is 1% but not less than 0. 1 ml/hr. This prevent the infusion line from blocking due to blood clots. A simple and safe Bolus function enabling the delivery of the shock does at any moment of the infusion with the preset rate as under, 300ml/hrfor lOmi syringe, 500ml/hrfor20ml syringe, 700m1/hr for 30ml syringe, lOOOml/hrfor 50/60ml syringe. Full information about the course of infusion Visual display of all the programmed parameters and infusion data such as syringe type and volume, the infusion rate, the infused volume, time remaining till the end of infusion and occlusion pressure limit. Ultimately 5 minutes prior the end of infusion. Alarm announcing the necessity to prepare another dose of the drug. In Memory Mode, this convenient feature retains the previously selected data of delivery rate and limit so they do have to be re-entered. This not only saves time and effort but also helps reduce errors. Complying with high standards, that assures a low and high voltage working environment, another important feature of the unit. A built in battery Guarantees safe operating of the pump in case of mains failure. When patient is being ransported. Looking for Infusion Pump Various Models ?